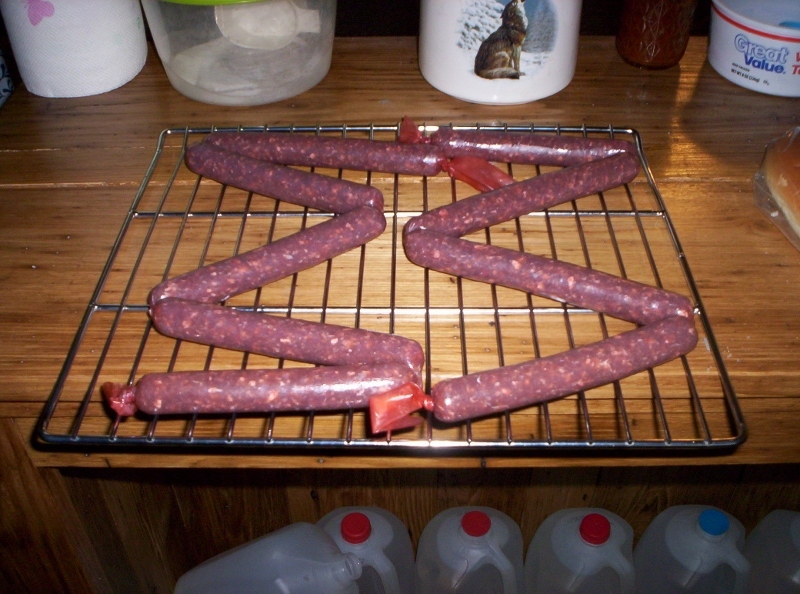 My first attempt at deer snack sticks .. I'm using Hi mountain cures ( original flavor ) snack stick kit.. Did up 2 pounds , filled the casings and put them in the fridge to cure . Tomorrow I will fire up my new smoker ( from cabelas ) and smoke them with hickory chips for 2-3 hours . I make a lot of jerky with Hi mountain cures and like it so hopefully these will turn out as good .. Any body else make the snack sticks ? That sounds awesome Joe. Wonde if a product like that us available in Oz. 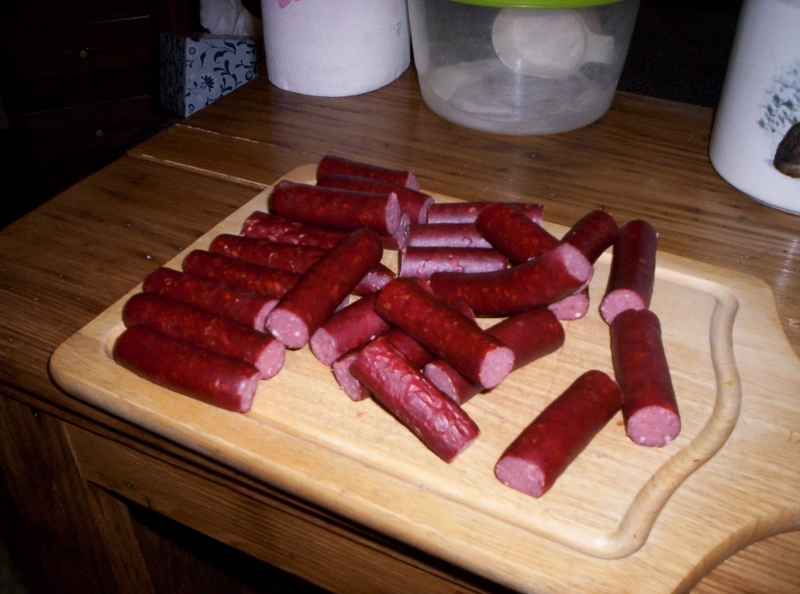 Ive stuffed a salami casing with sausage mix then slow cooked on top of fire box in smoker overnight. turned out ok just had to keep it in fridge and fight the kids for it. I made a few kilos of beef jerky and the never made it to storage.. Eaten within the hour of it coming out of the drier..
How well I know that one. Oooh...Home made Slim Jims and pepperoni sticks. Got it. Yes...Need to know how they come out. The finished product .. Between 2 and 2 1/2 hrs at 200 degrees they said to get the internal temp to 165 I took it to 170 and smoked with hickory for about half the time. There not that bad the next batch I think i'll smoke with apple wood and compare them. Damn!! Now I'm not only hungry, but thirsty too. Where's the beer? You and me together Bushy...they look awesome. Good job Joe...I'm droolin' all over my keyboard mate. Ohh mann!! Those looks yummy!!! Damn.. now I goota get me some cabanossi.. otherwise there wont be any sleep tonight..
hmm now I will have to go searching...two gluten free mouths in our house and one that cant handle preservative 202 makes shopping a little tricky. What kind of casing are you using? Natural or artificial, was wondering if the smoke penetrated the casing very well.